Parkavonear is a 13th century Norman castle that overlooks Killarney National Park from a stunning location in Aghadoe. The castle is situated beside the ruins of Aghadoe Cathedral, Round tower and adjacent graveyard. When you are in Aghadoe for the panoramic views, stay a little longer and take a wander through the ruins of Parkavonear. One of the delights of Killarney is spending time on a boat on Lough Leane, the largest of Killarney’s three lakes. As you looking north the hill of Aghadoe rises up from the shoreline. 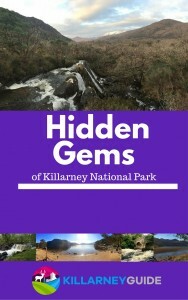 The early inhabitants have always identified Aghadoe as a strategic location of the Killarney valley. The view from above the lake, looking down on the valley, was what made this location so valuable. Nowadays, the views are treasured for different reasons and thousands gaze in awe from Aghadoe every year. Let’s stop in at a Norman castle while we’re there. Parkavonear Castle is located in Aghadoe, about 5km north west of Killarney town. There are two main approach routes from Killarney – via the N22 (Tralee) road or alternatively via the N72 (Killorglin) road. If you are driving, it’s best to approach via N22 and perhaps make the return journey via the narrower road (Bohereen na Marbh) that joins the main Ring of Kerry N72 road. If you are walking or cycling, please be aware that there is a significant incline to Aghadoe. If that doesn’t deter you, make sure to take the quieter (and steeper!) road via the N72 route on the map. There is a parking area adjacent to the Aghadoe Heights hotel which is where many people park to go to the nearby viewing point. This is quite close to Parkavonear so this is the best place to park if you are driving. From the car park, cross the road to the meadow and follow the path to the viewing point. This vantage point is a truly spectacular location to take in some of the views of the Killarney Valley. On a clear day your view will stretch from beyond the Paps of Danú in the east to the high peak of Corrán Tuathaill to the west. Beneath you lies Lough Leane, the largest of Killarney’s lakes with Innisfallen Island at its heart. There is an excellent information board with a panoramic photograph of the view that identifies all the points of interest and mountain peaks in view. After enjoying the view, head across the meadow on your left hand side towards Parkavonear Castle. You can also access the castle by returning via the path to the main road and following the roadway adjacent to the nearby graveyard. Aghadoe or Achadh Deo has a number of different interpretations as to the meaning of its placename. Growing up I was led to believe that it was the ‘field of the two yews’ – a reference to the trees often found in burial grounds. However the details on logainm.ie would seem to dispute this. Only the ‘field’ (achadh) part seems to be clear! The nearby Parkavonear derives its name from Páirc an mhóinéir (‘field of the meadow’). I think it’s safe to assume that there was plenty of open grassland and meadows here when the place got its name! Aghadoe is a special place for many and I have always been drawn to it. My mother tells me that I let her know my time to arrive into the world was imminent while she was having lunch in the nearby Aghadoe Heights hotel. Luckily for both of us, she made the short journey down Madam’s Hill to the District Hospital and I arrived safe and sound. From a too young age, I would return to Aghadoe several times a year to visit my Dad’s grave. Even on those sometimes sad occasions, I always loved being in Aghadoe. On many a windswept and wet Christmas morning visit, I glanced in awe over my shoulder at the view from the graveyard. Even on those miserable, wet and wild winter days, there was always something magical about the place. As a child I often wandered through the ruins of the old cathedral and the round tower in the grounds of the old graveyard. It was only in later years however, that I ventured a few hundred metres down the road to Parkavonear Castle. Parkavonear Castle dates back to the 13th century and is said to be one of the very few Norman castles of the time to have a circular design. (Most were rectangular in shape) The thick walls are still largely intact as is some of the original staircase to the first floor. As you wander around inside, you can peer out through the windows to the stunning views of Lough Leane to the south. It’s not often you find the ruins of a round tower, a Norman castle and a cathedral all within the same field. The old adage of ‘location, location, location’ was certainly apt for those that built in this location all those years ago. And it still holds true today. Make sure to pop in to Parkavonear the next time you experience the magic of Aghadoe.